This article is part of a series of interviews conducted by LIM students with members of the Council of Fashion Designers of America (CFDA). Students are enrolled in Fashion Merchandising Professor Andrea Kennedy's Intro to the Fashion Business class. 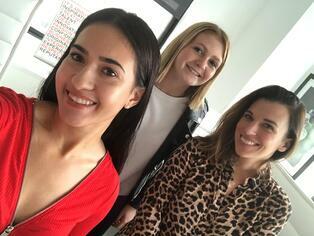 At the CFDA’s Bleecker Street office on November 5, 2018, we interviewed Director of Strategic Partnerships, Ashley-Brooke Sandall. Ms. Sandall is from Ann Arbour, Michigan and studied at the University of Michigan, graduating in 2003 with a communications degree. During our interview, she shared her journey in fashion and explained what she thinks "making it" in the industry looks like today. Sandall’s mother was a model and really inspired her to be interested in fashion. She told us that her mother had an amazing closet full of beautiful designer pieces, which sparked her curiosity. More inspiration occurred years later, when Sandall actually spotted John Varvatos at Barney’s and walked right up and introduced herself. The connection paid off in the form of an internship at Prada post-college. Sandall’s internship with Prada soon led to a full-time marketing position with Stuart Weitzman. She worked on rebranding to target younger consumers, partnering with stores that had the ideal customer base and working on getting Stuart Weitzman carried in those locations. Later moving on to American Express, Sandall worked in integrated marketing. She explained she worked with companies, such as Chanel or Prada, that would come to American Express to identify premium cardholders who spend a certain amount a month, with the intention of marketing to the segment that could afford to buy higher-priced goods. Once identified, the cardholders would then be invited to special events, so companies could learn more about this target demo. Sandall advises today’s fashion students to network constantly. In fact, when her boss at American Express moved to the CFDA, he brought Sandall with him specifically for her vast experience and connections in the industry. On the topic of industry connections, Sandall advised us to take advantage of volunteer and internship opportunities. According to her, it’s perfectly okay to use internship experiences as chances to realize what career path is best for you. Keep an open mind while in college, she recommends, since you’ll learn from experiences and people that will steer you in the right direction. Sandall had quite a few questions for us about our experience at LIM College. She's fascinated by LIM’s internship requirements, which her college did not require during her time there. It was interesting to her that we, as students, not only get to expand our knowledge but build a resume while doing so. Our conversation led Sandall to reflect on when she entered the fashion industry. Online shopping wasn’t nearly as popular then; but now, Sandall says the new generation of consumers is all about immediacy. Sandall admires the online boutiques in places like Instagram and Twitter and the omni-channel experience they provide. With customers having so much more control in transactions, many designers have also started focusing on ethically sourcing their products within just the past few years. Sandall explained how this is obviously a very good thing, and that it is important for the industry and designers to take steps to be as eco-friendly as possible.